Groundsman developed the Spigot Clamp type of mounting for a quick and secure attachment of Tine Holders to the HD (heavy duty) range of Turf Aerator machines including Tractor Mounting. 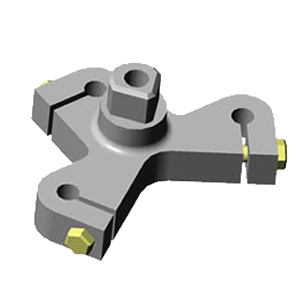 This type of Tine Holder is available for mounting the following number of Tines in each Holder; two (Twin Holder) three (Triple Holder) four (Quad Holder) five (Quint Holder). A range of sockets is available depending on the holder. A socket is the hole into which the Tine is clamped. The Draw Bolt is the type of mounting required to attach the Tine Holders in the Medium Duty Turf Aerator model 345 MD. These are available in Twin and Triple Holders only. A range of socket sizes is available. Generally used with the larger tines i.e. ¾" 5/8" or ½" where the wider hole spacing is desirable. Twin holders are also useful to achieve maximum depth where conditions are very hard and compacted. The choice of tine would depend on the severity of the compaction, i.e. the finer the tine the easier it would be to achieve full penetration. Twin holders are available in all four-socket sizes including the recently introduced 7/8" sck. for Jumbo Hollow Tines. Socket Size : 1/2" 5/8" 3/4" 7/8"
Normally used with the medium sized tines i.e. ½" or 7/16" although the smaller micro tines can be used where conditions are compacted or the pattern produced is desirable. The 1 ½" slit or 5/8" hollow and solid tines are generally not recommended for use in triples and certainly used only if conditions are soft and an exceptionally large amount of soil is to be removed or disturbed. This holder is available in three socket sizes therefore all tines except 7/8" socket jumbos will fit. Socket Size : 1/2" 5/8" 3/4"
Normally used only with the smaller tines, i.e. 3/8" and 5/16" for micro hollow and solid tining including needles all of which fit the ½" socket. The Quint Holder can also be used for over-seeding preparation or thatch removal. Socket Size : 1/2" & 1/2"
Aeration Pattern : 1 1/2" 1 1/4"